The Machine Movie is set in an impoverished world plunged into a Cold War with a new enemy, Britain’s Ministry of Defence is on the brink of developing a game-changing weapon. 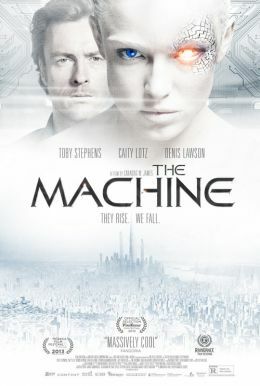 Lead scientist Vincent McCarthy (Toby Stephens) provides the answer with his creation, ‘The Machine’- an android with unrivalled physical and processing skills, a mechanised soldier and thinking robot that would not only have the ability to fight, but to negotiate and keep peace too. Vincent begins by placing implant chips into fatally wounded soldiers’ brains, to revive them into a state of controlled consciousness. When a programming glitch causes an early prototype to destroy his lab and threaten his life, McCarthy seeks more help. Fuelled by his own agenda to use the new technology to help give his sick daughter another chance at life, he enlists artificial intelligence expert Ava (Caity Lotz). Together they work to harness the full potential of a truly conscious fighting machine and to save his daughter from the grips of her illness. Thomson (Denis Lawson), Vincent’s scheming boss is only really interested in a killing machine that will follow his every command. When Vincent’s creation shows signs of true consciousness and intelligence Thomson orders it to be deactivated. But The Machine has its own ideas and fights back with vengeance.